They are useless to define a band musical work), with all that velocities and musical aggressiveness that extreme Metal fans love. But hold your horses, because there are thinking minds behind their musical work. Yes, the musical arrangements sometimes are full of personality, and some technical touches that turn their album a very good experience for us all. Be prepared to be engulfed by a hellish whirlwind of insane riffs, sickening solos, thunderous rhythmic kitchen and guttural grunts as you never was before. Originally, "Malignance" was produced by the band itself along with Jeff Bryan, wh did the engineering along with Mike Taylor. The remastering was done by Ken Sorceron (yes, the same one from ABIGAIL WILLIANS), so be prepared, because the sound quality is very good, keeping the band's musical work as ferocious and thundering as it was, but with a better sound quality, being clean when it needs. And as a reissue, it got a new cover, created by Remy Cuveillier. And there's a bonus: an unreleased track, "Venomous Inquisition". 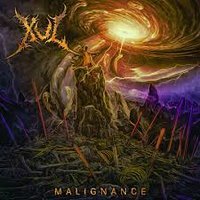 It's not a perfect album, because XUL can go further into their own style and find more to show us. But to be honest, they are excellent, and songs as the thunderous "Mastication Of Putrescent Empyrean Remains" (where some brutal melodies arise in some points of the guitar riffs), the precious gem called "Winter's Reign" (what fantastic and excellent tempo changes in this instrumental song, melodic inserts from keyboards, and hear how the rhythmic session is perfect here), and the violent storm of musical chaos called "Hordes Of Black" (very good grunts, indeed). But remember: they can do way better than we hear on this album. For now, "Malignance" is an excellent album.